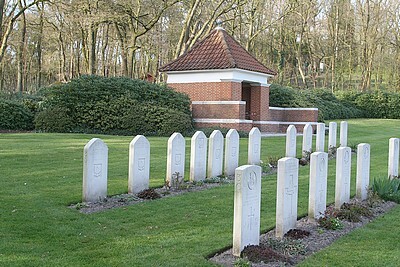 Polish War Graves at "Mook"
The nine Polish soldiers, who were killed in action in the outskirts of Alphen, the Nethetlands, were buried there in field graves. 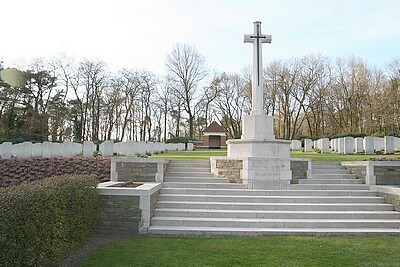 For unknown reasons they are later on exhumed and transferred to the British War Cemetery at Mook, the Netherlands. Two others Polish victims, who have been killed south of the river Maas, have been transferred for unknownn reasons to Mook as well. In Mook is buried KRZECKOWSKI Mieczysław as well. He died as a Polish Parachutist in the Operation Market Garden and for long years he has been buried under a wrong name.